We need a rickshaw slave for transport the Ladies in the OWK Castle Area. by Mistress Courtney - Official Court Executrix of Womania Empire! The crime of HARMING THE PRODUCER’S RIGHTS is committed by every person who downloads - or watches it by streaming - any filming or image material placed on any web site without the producer's explicit consent. These are, in particular, pirate sites or web sites that allow free uploading and subsequent viewing of videos or images protected by copyright. A person also commits the same crime if She/he uploads filming or image material to any web site without the producer’s knowledge, or if She/he gives access to other persons to watch or view such material without paying the producer. Support us too - here is not any minimum limit! Worship, Obey & Serve WOMEN every day! Not only on March 8! Join Womania Empire Castle Fund! 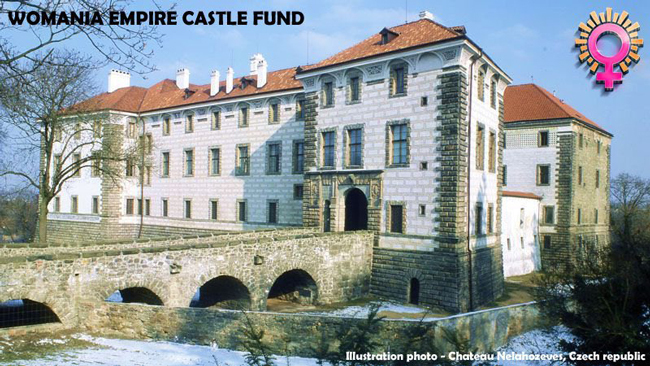 and send a few dollars for our future Castle!